The Big Draw event at Manchester Art Gallery pulled in the crowds throughout the day as drawing interventions took place in every corner. As they entered the building, people were invited to hold streamers to create waves and ripples of colour as they wheeled around the gallery. Visitors were invited to pose for silhouette drawings which were then suspended around the impressive entrance to the gallery. Elsewhere, a community-initiated project invited visitors to make their own drawing robot which could wheel itself around gallery spaces, leaving a coloured snail trail. I developed and facilitated a free-flowing shadow drawing laboratory. After a couple of days' work lining the entire studio floor with white paper and suspending sheets of thin, white fabric to form a cube which you could enter, the base for the shadow laboratory was built. Old overhead projectors (OHPs) were positioned outside of the cube so that people could sit inside and watch projections and passing shadows. Visitors were invited to scribble on the floor and could make their own shadow puppets, shapes, transparency textures and projected drawings on acetate. Ropelights, a fabulous coloured spectrum light and abstract music also enhanced the experimental, fluidity of the space, which changed constantly through the multitudes of interactions. Young children sat and scribbled, watching the moving silhouettes and shadows - some tried to catch them, grabbing the gauze screen. 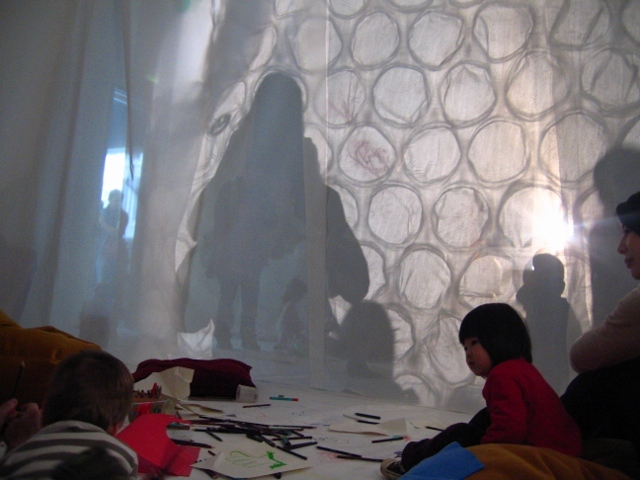 Older children and adults enjoyed creating endless projections with shapes, puppets and drawings. 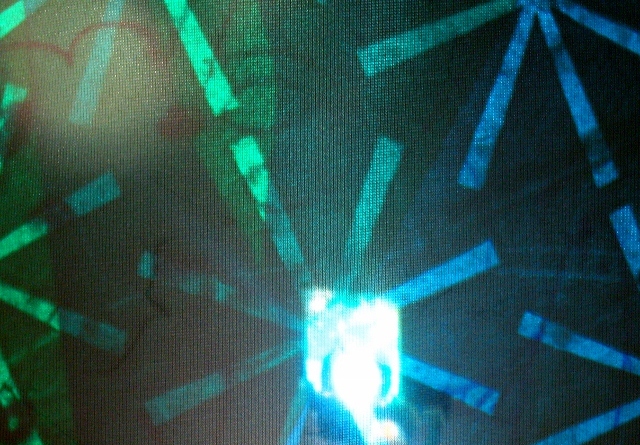 One OHP was closer to the projection screen than the other, giving a smaller and clearer square of light which formed the frame of a mini shadow theatre. The other, being slightly further away from the screen, enlarged the shadows and transformed the atmosphere inside the cube as different things cast shadows over the projection screen. On the whole, the installation was fun and offered a range of possibilities. I had aimed to create a tranquil and calming space, however, the event itself was exceptionally busy so the space was packed throughout the day. Nevertheless, people dipped in and out and some remained there for much longer, simply bathing in the light!